When money is no object and only the very best will do, the new Stella FD range of fixed spool reels should set your imagination running wild. Designed with a new screw-less construction around Shimano's benchmark SR-system components, with a stunning magnesium body - the new Stella FD is in a class of its own. With four models in the range, the 4000 edition has 13 shielded A-RB bearings with a roller bearing, bringing it up to a 17 ball bearing equivalent. 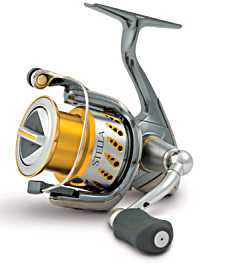 The Stella FD is also available in a 3000 shallow spool version. Reels don't come smoother or sexier than this...ultra lightweight and oozing with high specification features from Shimano's benchmark SR portfolio.